Upon stepping into the hotel lobby you are hit with the smell of fresh baked gingerbread. As if someone had just pulled gingerbread cookies straight from the oven. However it is not the smell of fresh baked cookies frosted and shaped like little men you are smelling. No you are actually smelling the thousands of brick size gingerbread cookies that make up a life sized gingerbread house! 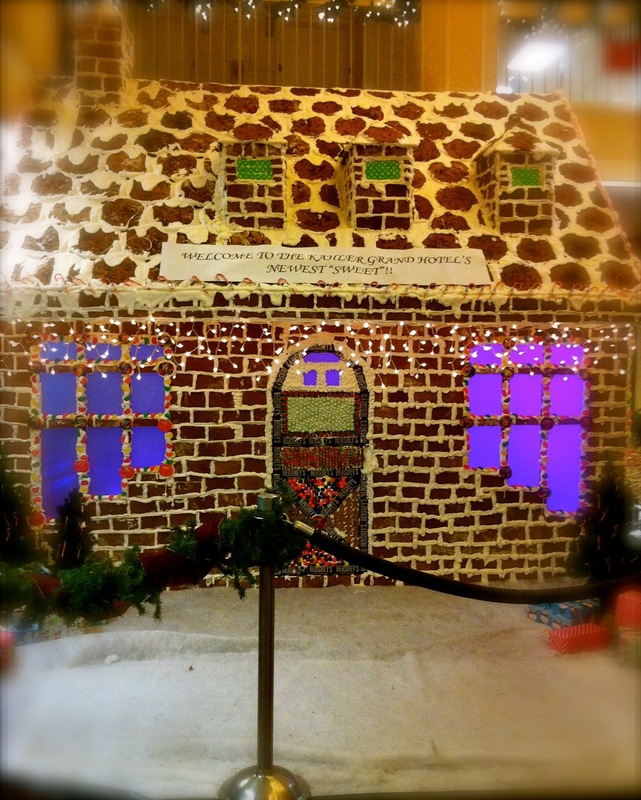 Constructed of 4,000 Pounds of Edible Gingerbread. Measuring 16 feet tall and 12 feet long and made of 3,600 gingerbread bricks, 400 cookie roof shingles and 800 pounds of flour, which sit smack dab in the middle of the hotel lobby! This projected went underway in July and was competed and ready for a ribbon ceremony on December 1st! The reason behind this massive project of holiday cheer? Simple, you see Rochester is home to the Mayo Clinic. And thousands upon thousands of people/families travel to Rochester year round to receive top of the line medical care. The Kahler thought it would be nice to provide out of town guests (many who are here to go through the clinic) with a spirit lifter this holiday season while they stay at the hotel. 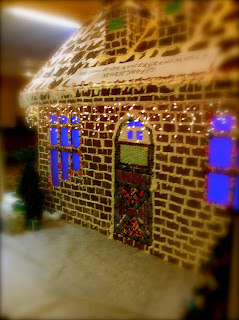 I have to say stepping into the sugar filled lobby, entranced with the smell of gingerbread brought a smile to my face. 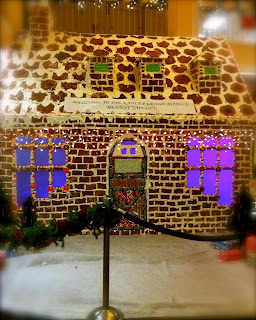 I felt like a child again, enjoying the simple marvel of a house made entirely of candy and cookies. Not only was the house a marvel to look at, but the meaning behind this gesture speaks volumes to the staff of the hotel. A gesture that shows thoughtfulness, caring, and compassion for other peoples feelings! This simple act of holiday cheer, and thought for others is what I am loving this Wednesday! So I have one simple question for you today! How are you spreading Holiday cheer to others this holiday season? That is a wonderful way of sharing holiday cheer. Thanks for sharing! Delicious. Are you from Rochester? I grew up in Wabasha over by Lake City. :)I have a lot of friends who work at Mayo. They have an AWESOME gym. This Saturday I am volunteering at the Mass Appeals Annual Event to hand out gifts to the needy kids in Boston, can't wait! I love a good gingerbread house and hopefully when I get my xmas cards out the door I can spread that holiday cheer, too! Yum! That gingerbread house is so cool! I feel like its hard for us to make those little ones that come in a kit, haha. How did they make one so big!? I'll be donating some toys to Toys for Tots today to spread some holiday cheer! I love me some holiday cheer! Oh my goodness this story just warmed my heart. Happy holiday season to you! Have a great day! Thanks for helping me get into the holiday season! what a great way to spread holiday cheer for sure! it is tough enough being in the hospital or having a family member in the hospital during the holiday season, i can imagine. but what a great way to make sure it is still christmas! Hi!!!! I just wanted to stop by and say Thank You for visiting www.jinfitness.com today! I love your blog and it's great to find others that share the same interests as me. I am now following you!!! yay! WOW that gingerbread house is amazing ! This is so wonderful and amazing! And inspiring! Thanks for sharing!